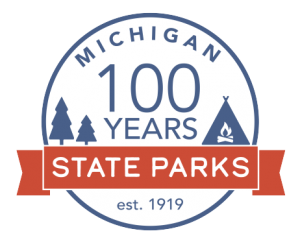 The Michigan Trails & Greenways Alliance participates in a number of special events to advocate for expansions in our trail networks as well as to raise vital funds for our work to build, connect and promote trails. Named one of the “Top 10 Multi-Day Rides in America” by Bicycling Magazine, The Michigander combines beautiful trails, Great Lakes beaches, lighthouses, rivers, virgin white pines, and a healthy serving of brewpubs.The Michigander Bicycle Tour is also a part of the Michigan Fitness Foundation Challenge. This challenge endorses local, regional and state events consistent with the Governor’s Council mission to promote healthy choices, while offering a physical activity event open to all participants, regardless of skill level or age. The 28th annual Michigander Bicycle Tour will take place July 13-18 on the Sunrise Side, featuring a 2-day and 6-day ride that showcases Lake Huron, the Iron Belle Trail and the 100th Anniversary of the Michigan State Parks as it travels through Tawas City, Oscoda, Lupton, Rose City, Higgins Lake, Cadillac, Tustin, Leroy, Reed City and Evart. Riders will enjoy the Rifle River Recreation Area, Higgins Lake State Park and William Mitchell State Park as they travel along the Iron Belle and the Fred Meijer White Pine Trails, as well as a portion of the Pere Marquette Rail Trail. The Great Lake-to-Lake Trails Route #1 Inaugural Ride will bring together cycling enthusiasts for the first time on a 275-mile sightseeing trails adventure from South Haven to Port Huron. Highlighting Michigan’s multi-use trails system and back roads, the Great Lake-to-Lake Trails Route #1 Inaugural Ride cyclists will pedal through award-winning scenery in popular tourist destinations as well as towns off the beaten path. Riders will stay in hotels and inns along the way, flocking to each town during the evening, eager to explore local flavor, culture and eateries. The ride celebrates the opening of the trail that culminates the unification of 9 counties, 34 municipalities and 42 townships in the state’s first fully-marked destination trail and will help to feature continued national attention on the nation’s leading trail state. The 7-day, 6-night ride begins on the beautiful Lake Michigan beach town, South Haven. The route is connected by 16 individual trails, and these trails go through many popular Michigan destinations, including Kalamazoo, Jackson, Brighton, and Rochester Hills. The ride ends in the historical town of Port Huron, with picturesque views of Lake Huron.